How is waxing done on wood? 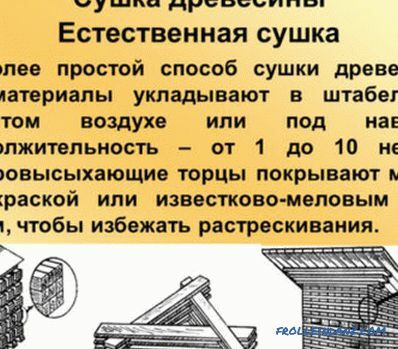 Currently, many means are used to protect the wood from deformation, moisture, scratches, rotting, damage by fungus and various microorganisms. Wax impregnation not only protects the wood from rotting, but also emphasizes its structure and beauty. Also, the tree needs protection from solar radiation and exposure to various chemicals. 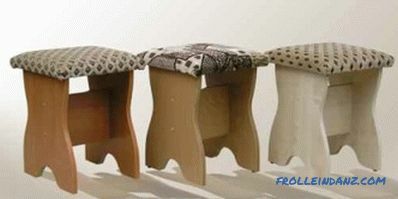 Means to protect the tree give it a great appearance, emphasize the structure of wood, its design and natural beauty. Various varnishes, paints, oils are used for wood impregnation. One of the most reliable and proven means to protect the tree is wax. Waxing is one of the most ancient and high-quality wood processing methods. Wax improves the decorative functions of wood, emphasizes its texture, makes the surface velvety. Now the industry produces a wide variety of different wax compounds for application to wood and furniture. The material, ready for use, consists of natural wax and various additives, including oils. 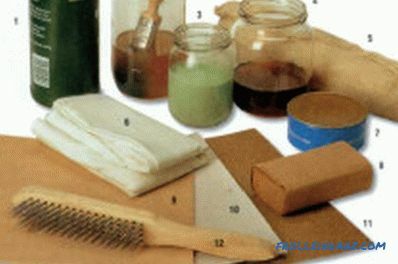 Tools and materials for wood impregnation. These compositions can be used immediately after opening the package. The composition gives the surface a smooth, glossy, necessary shade. It reliably protects a tree from destruction and influence of moisture. Any kind of wood can be exposed to waxing, but it looks best on products made of pine and spruce. Modern industry produces compositions of various colors and shades. How is wood wax impregnated? Wood treated with a wax composition retains heat, has excellent moisture-proof properties, and a long service life. If the surface of the tree is new and has not been covered with anything before processing, then processing is performed without prior preparation. 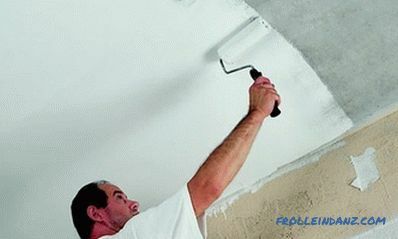 If waxing of a tree that has an old coating is intended, then the foundation must be prepared for the waxing procedure. If the surface of the tree is still new, then no treatment is required before waxing. 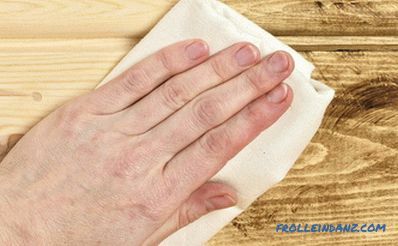 First of all, it is necessary to clean the wood surface from the old coating. If the old coating was lacquer or the wood was polished, then it should be cleaned with a solvent. It must be applied several times until the varnish or polish is completely removed. Then it is necessary to wash off the remnants of the old coating with warm water. If hard lacquer pieces remain after this, they should be removed with a carpentry knife, and then grout these areas with emery paper. Then, using a stiff brush, remove all remaining thinner and lacquer residues from the gaps of the wooden surface. After that, wait until the wood is dry. Then you need to sand the surface with sandpaper. If there are exfoliated wood fibers, they are cut with a carpenter's knife in the direction of the fibers, and then cleaned with emery paper. Then, using a stiff brush, scrape off small remnants of wood. 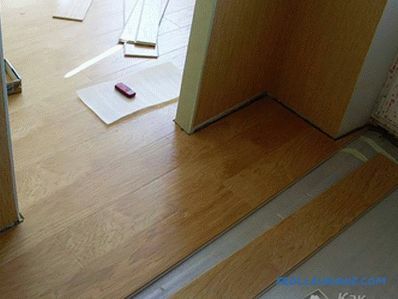 After the preparatory work, the wood surface should be flat and smooth. Wax is an environmentally friendly and inexpensive replacement for enamels and varnishes for wood. Wax is evenly applied to the prepared smooth dry surface. Waxing is done with a piece of cloth, as it does not have a nap. First, all flat sections of the tree are carefully treated. 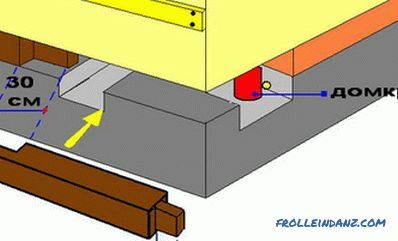 Then the tool is applied to the corners, slots, profiles, decorative items. This work is done with a small brush or toothbrush. Wax-impregnated wood is carried along the direction of the fibers. After waxing the entire area, wait one hour for it to fully absorb. Then the excess funds are carefully removed with a soft cloth. The composition should cover the entire surface of the tree, fill all the cracks, pores, hard-to-reach areas. Wax impregnation gives wood strength, moisture resistance and durability. If you need to get extra shine, then you need to re-process the entire area. 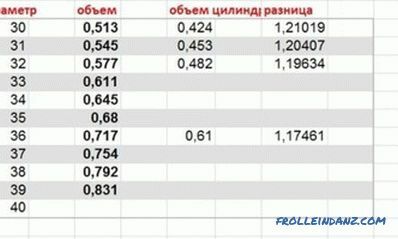 When this is absorbed only part of the composition. An additional layer is needed to form a special film that needs to be polished with a stiff brush. Wooden surfaces treated with a wax composition are indispensable for a child's room, bathhouse, residential premises, which are subject to increased environmental safety requirements. Care must be taken when using such products. Surfaces coated with a compound do not tolerate high temperatures. From heating, the wax coating floats and collapses. 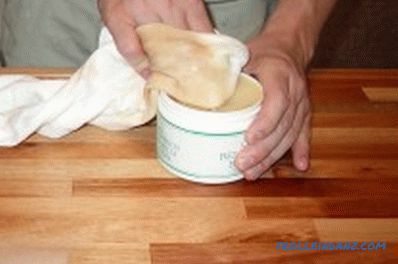 Therefore, waxing is not recommended for wood surfaces located in the kitchen. It is necessary to protect the surface of furniture treated with the composition from heating, not to put dishes with hot food on it. If necessary precautions are followed, a tree coated with wax can be used for a long time, as it has high strength, environmental friendliness and durability.